Wellington, FL - March 16, 2011 - The tenth week of competition at the 2011 FTI Winter Equestrian Festival began on Wednesday morning with a victory for Kent Farrington (USA) and Uceko, owned by R.C.G. Farm, in the $8,000 G&C Farm 1.45m Jumpers held in the International Arena at the Palm Beach International Equestrian Center. Today's competition kicked off week ten of the 2011 FTI Winter Equestrian Festival, sponsored by Artisan Farms. The week will feature the $31,000 WEF Challenge Cup Round 10 on Thursday afternoon, the George Morris Excellence in Equitation Championships on Friday evening, the $50,000 Vita Flex Match Race on Saturday evening, and the $15,000 Artisan Farms Young Riders Grand Prix and $75,000 Pennfield Feeds Grand Prix FEI CSI 2* on Sunday. Michel Vaillancourt of Aiken, SC, is the course designer in the International Arena this week. Vaillancourt set a great track for the first class and saw six of 28 entries jump clear. Held in a Table II(b) format, jump-off rounds immediately followed the competitor's first round course and five were able to jump double clear. 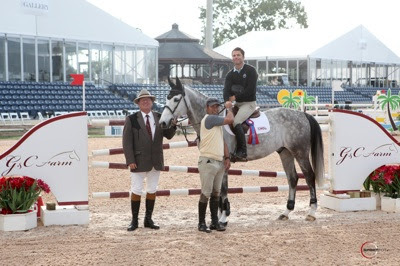 Kent Farrington and Uceko went in the middle of the class and completed the fastest jump-off round with a time of 34.221 seconds to earn the win. Scarface, owned by Tony Weight and ridden by Nick Dello Joio (USA), followed in second with a jump-off time of 34.479 seconds. The first competitors of the morning, Nicole Shahinian-Simpson (USA) and Candlelight Van De Warande owned by BG Retanage Rewide R. Kunce, jumped double clear in 35.865 seconds to eventually finish in third. Mario Deslauriers (USA) had three horses in this morning's class and advanced to the jump-off with all three to finish fourth through sixth. 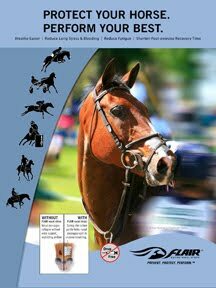 Deslauriers rode Cella, owned by Jane Clark to a clear round in 38.124 seconds to place fourth, finished clear with Clark's Urico in 39.045 seconds to place fifth, and rode his own Diablo to a four-fault jump-off round in 37.182 seconds to place sixth. Class winner Uceko is a ten-year-old KWPN Dutch Warmblood gelding by Celano x Koriander. Farrington is excited about Uceko's return to the ring this year after an injury gave the horse some time off at the end of his 2010 season. "I got him as a seven-year-old and as an eight-year-old he won a couple grand prix and jumped a few World Cup classes," Farrington explained. "He actually started doing the World Equestrian Games (WEG) Trials down here last year and jumped a clear round, but then he wasn't quite right and I gave him some time off. He injured himself in Calgary over the summer and had the rest of the season off, so he is just coming back. He has done a few 1.35m classes, a few 1.40m classes, and this was his first 1.45m and his first win of the season. I am hoping that he will be ready to step up and be back in the grand prix soon." Farrington spoke about today's course and how it suited Uceko as he gets back into top form. 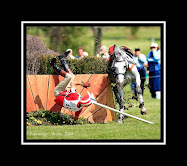 The rider noted, "He is coming back nicely. He can do anything, so this class was really just to improve his fitness and to get him back in the ring. He is a big jumper, so for him this was not a huge class; he just cruised around. He is small, but he is a little bit of a challenge to go fast on because he has a big, slow canter and a really lofty jump, so you have to plan a really tight track to go quick on him." Farrington is bringing Uceko back slowly and is happy with his progress. After the win today, he stated, "I am just going to wait and let him tell me what he's ready to jump and just pick and choose the classes. I probably won't do anything huge here at WEF, and then I will just get him ready for Kentucky and then Calgary." Farrington has many top mounts this year and also won the $6,000 Spy Coast Farm 1.40m later in the day riding Hilary McNerney's Vanhattan. Farrington and Vanhattan had the fastest of 20 double clear rounds in a large field of 78 starters. 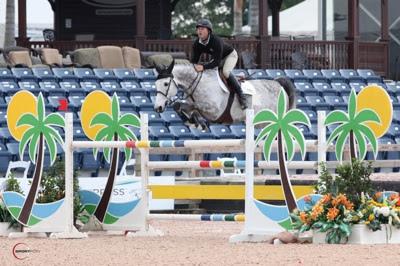 Farrington had a big win last week as well, topping the $31,000 G&C Farm 1.45m Classic aboard Haity McNerney's Valhalla. The tenth week of competition will continue tomorrow with the $31,000 WEF Challenge Cup Round 10 as the highlight class of the day in the International Arena at 1:00 p.m.